1. 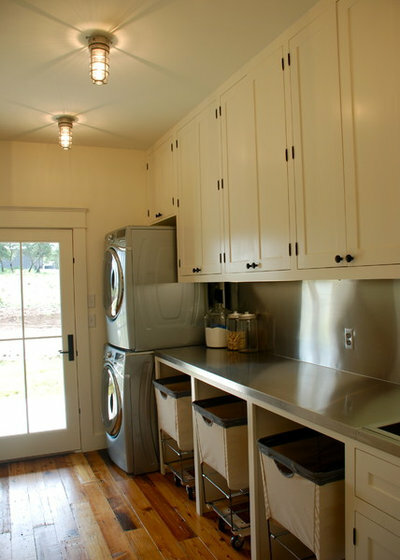 Raise your washer and dryer. 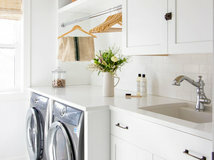 Front-loading washers and dryers have become more prevalent than top-loading types, due to higher energy efficiency and their capacity to fit more dirty clothes. However, most front-loaders are quite low to the ground, requiring you to kneel or crouch down to load and unload the clothes. Aside from the uncomfortable position, remember the clothes will be even heavier when wet. Some front-loading machines, like this Whirlpool pair (which is actually compliant with ADA height and front-reach requirements), are constructed with drums located at a higher height, which makes reach into them while standing much easier. Generally, a comfortable height is 30 to 36 inches for women and 33 to 39 inches for men. 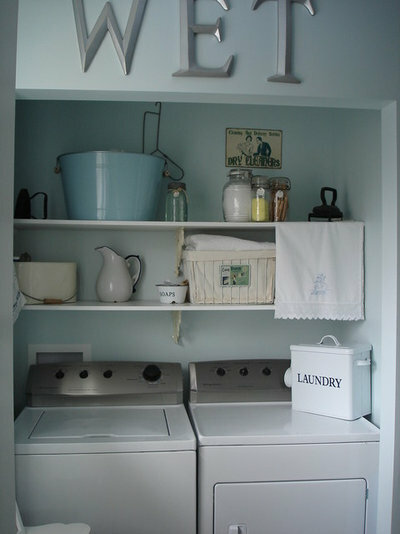 Plus, you can fit a sizable laundry basket below the drum to catch wet laundry instead of holding it sideways and upward. Raised drum designs can help save your back. 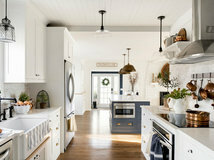 For this project designer Shane D. Inman created a custom cabinetry base to raise the front-loaders even higher, to what is midchest level for many people — certainly an easy reach in. 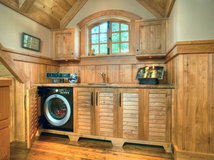 Inman says the cabinet pedestal was designed to accommodate the weight of the two laundry units and the stone countertop material. 2. Get a lower folding table. 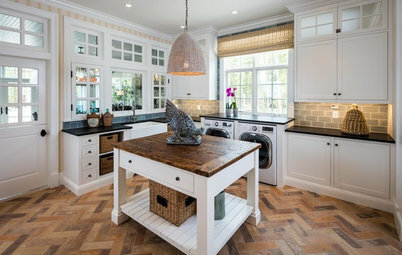 Most standard countertops are 36 inches high and are comfortable for the average person. Folding laundry, though, requires different body movement than, say, chopping an onion. When we fold large pieces, such as sheets and pants, our body twists, bends and leans over and forward as needed to get the job done. A folding table that’s a bit lower than standard height lets you lean into the job and is better for your back and shoulders. 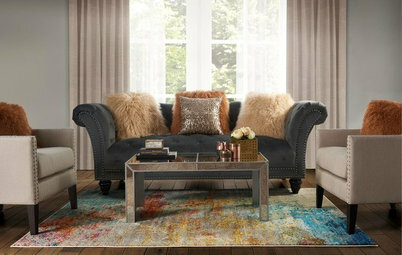 Keeping in mind your own height, shoot for a table in the range of 30 to 34 inches high or whatever is comfortable for you. 3. 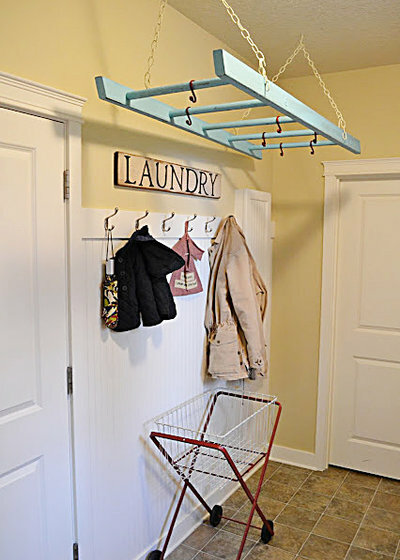 Use rolling laundry bins. Why lift a heavy basket when you can roll your laundry where it needs to go? Most rolling bins are heavy duty and commercial grade, and have edges that are typically cushioned with a rubber-like material so they won’t ding and scuff your walls. 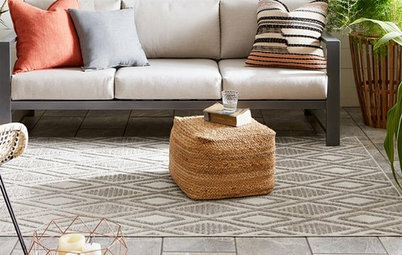 One thing to keep in mind is your flooring. If you have uneven tile or stone floors with a rustic or cleft-cut finish, rolling might be a bit more challenging. 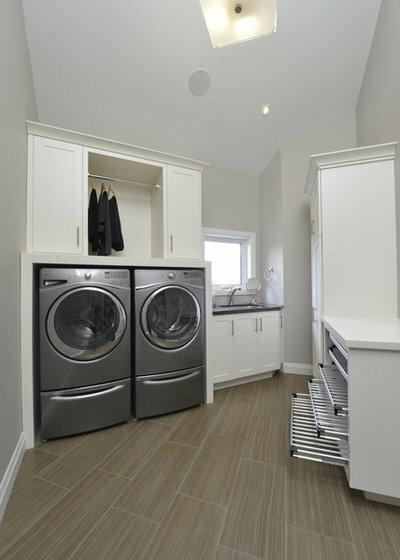 The rolling bins seen here have a 31-inch overall height and fit easily underneath cabinetry with room to spare for piled-up clothes. 4. Embrace open shelving. Open shelving makes any quick reach easier. You’ll also likely find you’ll keep things neater too, since things are on display. For frequently used items, a shelf height of about 62 inches is the most comfortable dimension for most people in a standing position. Reserve higher shelves for occasionally used items. 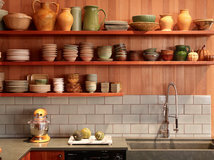 Don’t think that open shelving is reserved for just above the countertop. Lower open shelving is great for quick access. 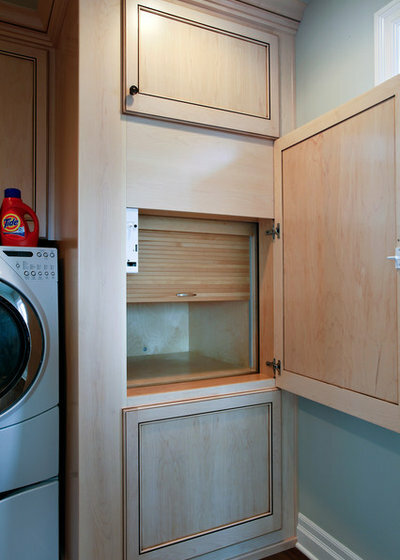 Plus, you won’t have to push full laundry baskets out of the way to open cabinet doors. 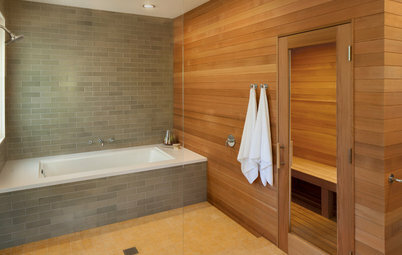 The problem with a deep sink installed in a standard 36-inch countertop relates to ergonomics. It causes you to stoop over to reach the sink bottom. 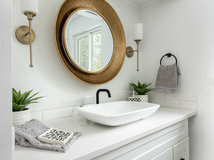 For example, if you take the 12¾-inch depth of this sink and subtract it from the average 36-inch countertop height, that’s only 23¼ inches high. Measure up from the floor and see where that dimension hits your body — probably somewhere on your thigh! If you’re going to install a deep sink, make sure it’s elevated. 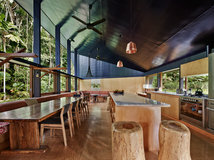 The one shown here was designed with a height of 42 inches, making its interior bottom surface 29¼ inches, about the comfortable height of a dining table. 6. Tap into a prerinse faucet. Surely at one point you’ve bordered on doing acrobatics just to wash and rinse something under a meager-size faucet. Generously sized with a high-arc, high-pressure nozzle, prerinse faucets are typically used in commercial kitchens to force food off plates before they’re washed. 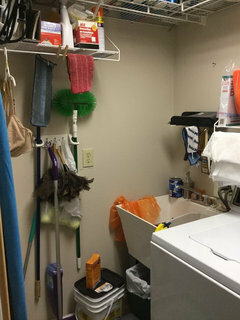 However, in the laundry room, the easy pull-down nozzle makes fighting muddy boots and food stains easier. 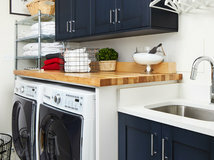 The large size can interfere with cabinets or shelving above your sink, so be sure you have enough clearance. 7. Integrate an ironing center. Many older homes have nifty recessed ironing boards, and it’s perplexing why they went out of style. Everyone hates dragging a heavy ironing board out of some closet or corner and setting it up, and then there’s the tippiness and cord combat that usually ensues. 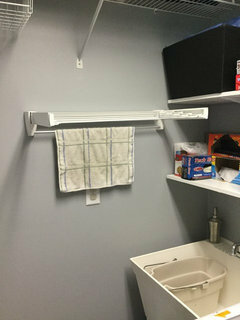 With a wall-mounted system, like the one shown here, you can install it to your desired height, and there are also swiveling models for tight spaces that turn the board right or left by 90 degrees. There are also great sit-down options. 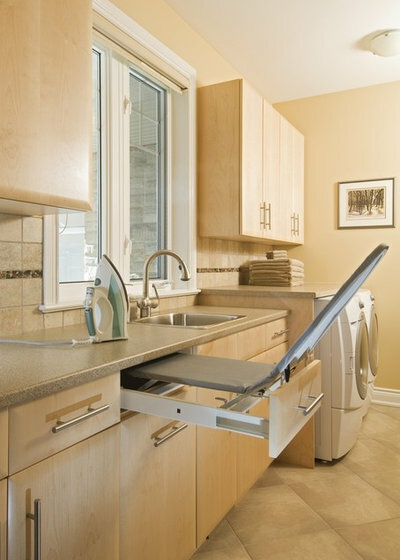 Wall-mounted units can hold only a hinged ironing board, so you still have to store your iron elsewhere. And they don’t come with electrical capabilities, so you’ll need to install the system near an outlet. 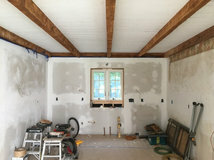 Plus, they must be attached externally to wall studs for support, and they protrude from walls quite a bit, so consider how that will affect your overall space. If you have the luxury of planning ahead, you can easily incorporate a recessed system that fits in the space right between your wall studs. 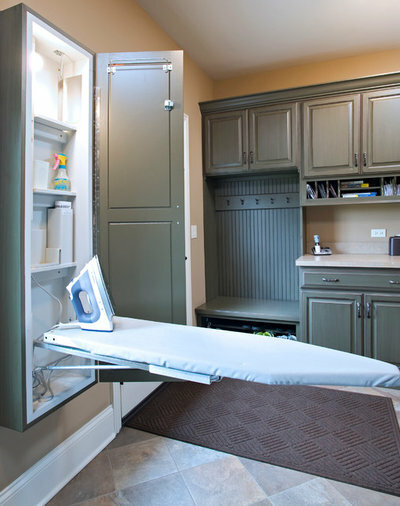 These allow more space so you can store your iron or even include a garment hanger. 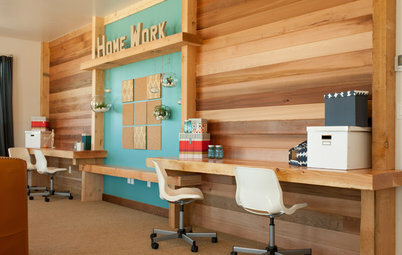 Plus, an electrician can run electricity right into the unit for an iron and/or a work light. If you don’t have the wall space available for a wall-mounted or recessed ironing center, consider one that’s drawer-recessed. The Ironfix by Hafele, shown here, fits into a 24-inch-wide, 14-inch-deep space and, once extended, rotates 180 degrees. Two cons are that you’ll still need to store your iron somewhere, and the drawer unit will need to be installed near an outlet. Also, you’ll need to be content with the ironing board’s height, which will be close to 35 inches if installed in a standard-height cabinet. 8. 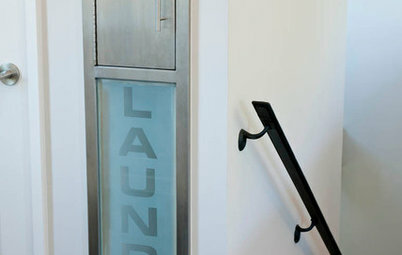 Plan for a laundry chute. 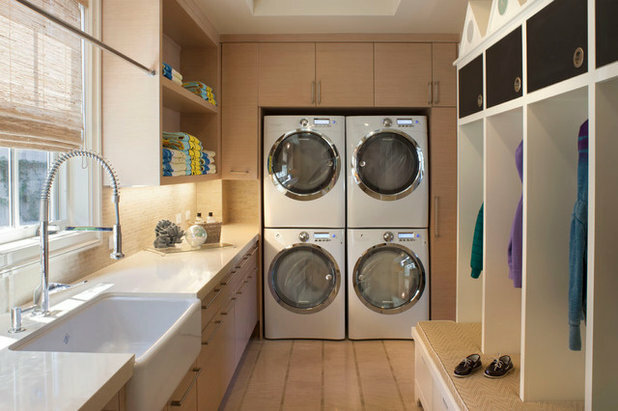 If your laundry room is on your ground floor or in the basement, you’ve likely cursed a few times while lugging a full laundry basket — or three — down the stairs. Instead, let gravity do the work. 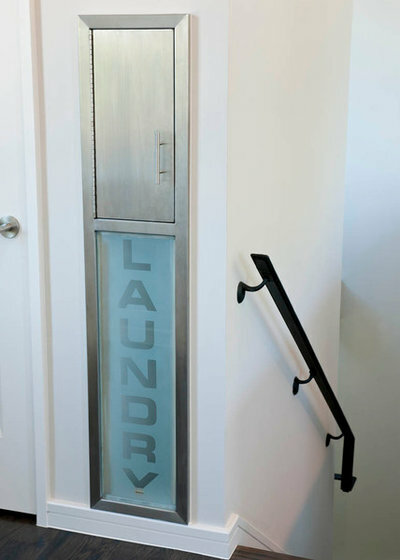 A laundry chute doesn’t require much room, so if you’re building a new house or planning a renovation, it’s a design element worth considering. You’ll also want to consider where the clothes will fall to. 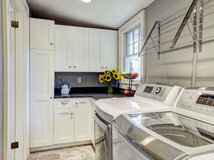 Tatum Brown Custom Homes notes this laundry chute is located on the second floor and is directly above a cabinet in the laundry room, so instead of making a messy pile in the laundry room, dirty clothes and linens end up in a contained space next to the washer-dryer. 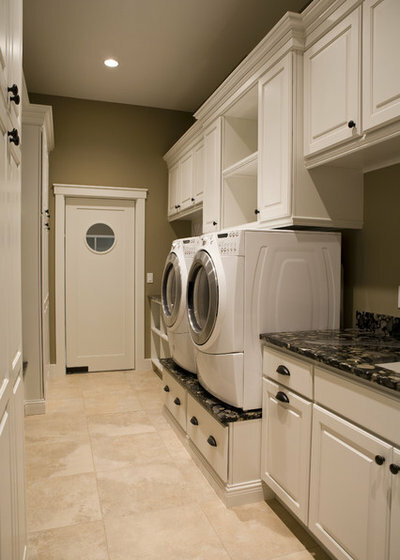 Here’s an example by Oglesby Construction Company that incorporates a tambour door to catch falling laundry. 9. Don’t overlook air-drying systems. For clothes that are destined to be air-dried, here’s a great feature the British have been using for centuries: a ceiling-mounted pulley system. The rack is composed of either four or six laths suspended between two cast iron ends and anchored to a marine-style wall cleat. To load and unload, lower the pulley to your desired height by pulling on the cord. 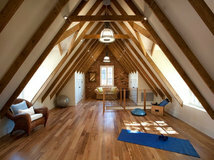 Raising it upward keeps longer articles from brushing the floor and also makes use of warmer air at the ceiling level. When not in use, it’s out of the way. 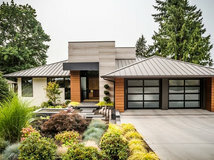 Although this particular example, by Crisp Architects, was custom designed, similar systems can be purchased through Pulleymaid. Just make sure you have adequate support in the ceiling. 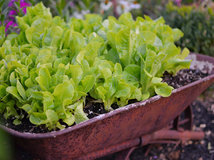 By itself, a system weighs between 6½ and 10 pounds. 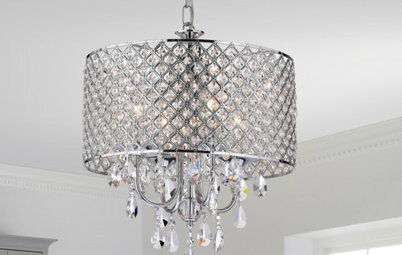 You’ll need about 9 inches of clearance from the ceiling to clear any encroaching door swings. 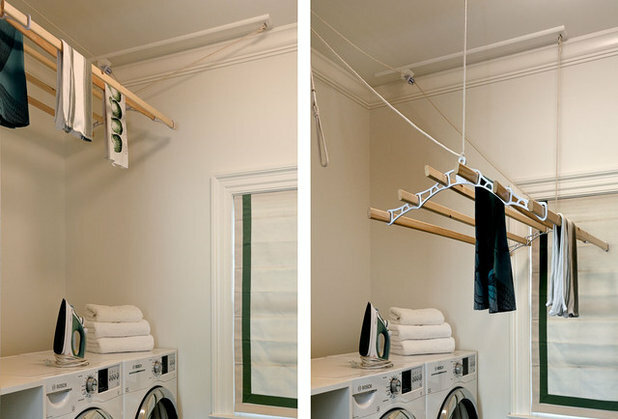 If operating a pulley isn’t appealing, and you have the space, a suspended ladder with hooks will work just fine. This one is hung at door level, approximately 6 feet, 8 inches, an easy reach for most with a hanger in hand. Larger, longer S-hooks could also be used for shorter people for an even easier reach. 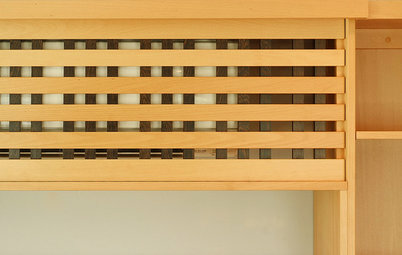 Often seen in hotels, retractable drying lines are also great for drying delicate items. Unlike ceiling-mounted options, they take little force to draw out and can be hung at any height desired. 10. Get a step stool. 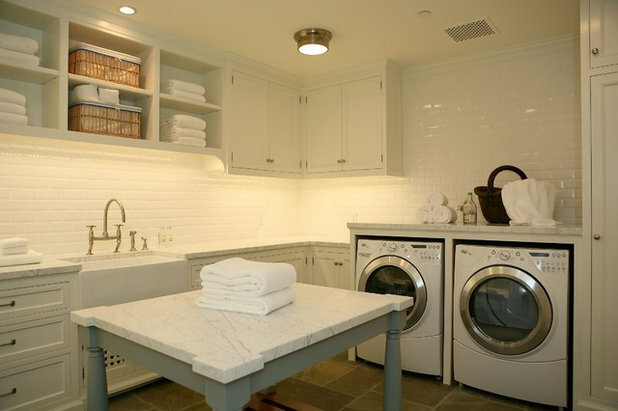 It might sound surprisingly basic, but a one- or two-step stool is invaluable in the laundry room. Because it’s so lightweight and easy to grab, you’re more likely to actually use it versus getting out a heavier, more cumbersome three-step ladder — or worse, attempting to reach something too high without the help of anything. Just make sure the stool you select has a nonslip surface; spilled bleach and liquid detergents can make it mighty slippery. 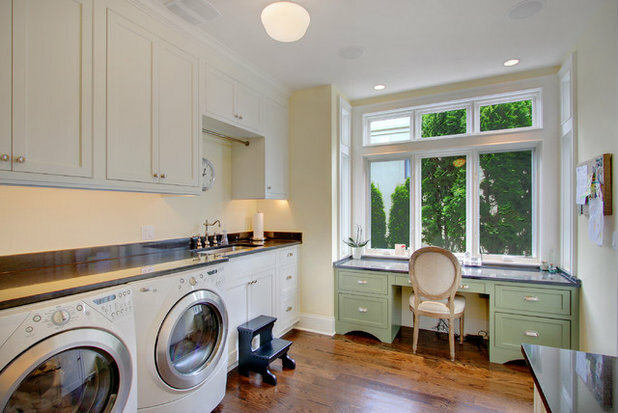 I would love to see examples of before and after laundry rooms for small spaces. 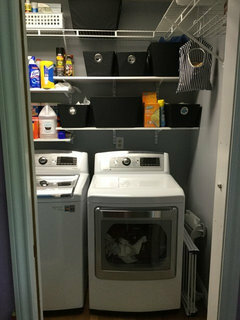 My laundry room currently has the washer and sink located on a short wall by the door and the dryer located in front of the door. I can't figure out how to update the space with the current layout and would love examples of rooms that were updated with a similar layout. 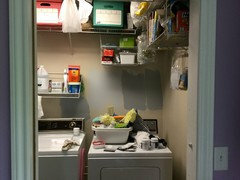 Here's our before of a small laundry room. 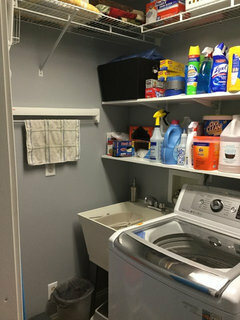 It's just wide enough for washer, dryer, and utility sink. 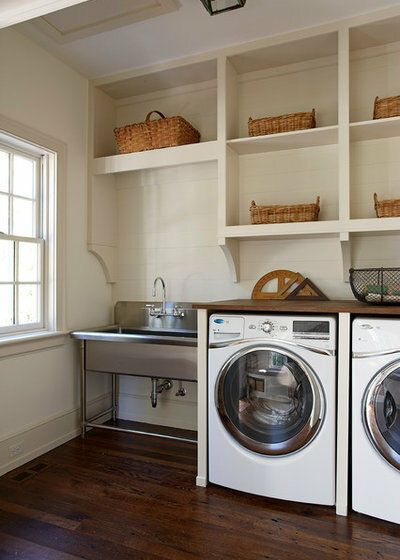 The space in front of the machines is just enough to set a rectangular laundry basket in front (but not enough to actually stand in front when the basket is there - you have to stand to the side). The door to the room is a pocket door. Expanding the size of the room unfortunately was not an option so we added storage. We opted for shelves (a) because cabinets are expensive, and (b) because my husband is an "out of sight, out of mind" type, so he needs some things to be out in the open. The wire shelving you see closer to the ceiling was already installed when we bought the house. On the wall opposite the utility sink, not pictured, is a rack for the iron and ironing board and a rack for brooms and mops.